The morning began as usual for Murshida Ismail. She rose, woke her husband and her little boys, and set about making the family breakfast. She reached for an egg, cracked it, and dropped its contents into a bowl And then the morning became very unusual indeed. For in the bowl was not only the white and yolk of the egg, but amazingly enough, another tiny, perfectly-shaped egg (see photo). An egg within an egg! Was there ever such a thing? The Ismails didn't think so and they immediately contacted the Ova Prima Foundation. "Certainly such an occurrence is extremely rare," commented Dr. Bronson Phillips of the Ova Prima faculty. "I have never seen or heard of an egg within an egg and frankly I am intrigued. It is interesting to consider the possibilities of the inner egg. Is it viable? Is the genetic material contained within the inner egg a duplicate or twin to that in the mother egg? 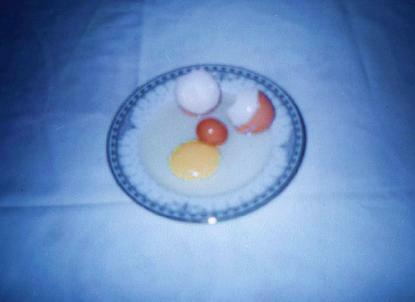 Or is the genetic material divided between the eggs, creating two unique embryos? And if the inner egg is viable, what sort of creature might emerge from it?" 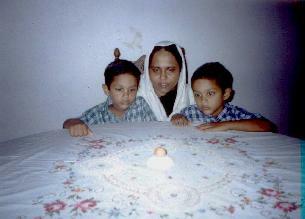 Murshida and the Ismail twins. (The Murshida-Egg in the foreground) Photo Credit: M.A. Ismail. By permission. Photo Credit: M.A. Ismail. By permission. Dr. Phillips convened a luncheon meeting of the faculty to discuss the phenomenon of ova intra ova. It is possible, concluded the faculty, that an egg within an egg may not be a biological rarity and could explain sudden, unexpected mutations within a population. Dr. Phillips and his colleagues are willing consider that this anomaly could have an impact on their understanding of the origins of the proto-chicken. Meanwhile, back in Sri Lanka, the Ismails are hoping that someone will be interested in studying the remarkable Murshida-Egg and are in contact with a local research institute. Dr. Bronson Phillips remains curious. "What I would really like to know is: what is inside that other egg?" Tulsa, Oklahoma - Sixteen people were injured, one seriously, in a riot at the 38th Annual Conference of the American Egg and Poultry Association in Tulsa last Wednesday. Witnesses say a disturbance broke out after a panel discussion hosted by the Ova Prima Foundation. "The discussion was very interesting and everyone behaved professionally, " says Marshe Arends of the Golden Griffin Egg Farm in western Washington state. "But afterwards, one of the chicken people got angry and shoved one of the pro-eggers. Then someone started throwing rotten eggs and things got real messy." Sixteen people were hospitalized after the brawl. Arnold Legg of Birmingham, Alabama is still listed in serious condition at Tulsa General after being struck on the head with a picket sign. A spokesman for the Ova Prima Foundation stated that violence is incompatible with a scholarly discussion of the age-old ' which came first?' question. "Ova Prima has always worked to set the egg and chicken debate on a scientific and scholarly footing. In light of recent scientific discoveries, we are hopeful that the debate will be conclusively settled without further bloodshed." The Ova Prima Foundation has denied any affiliation, philosophical or financial, with Eggs First!, the militant activist group. 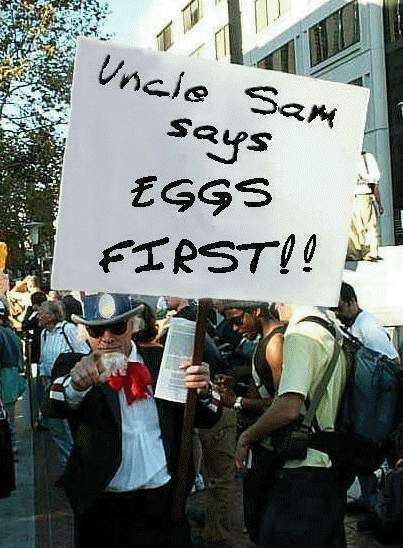 Eggs First! 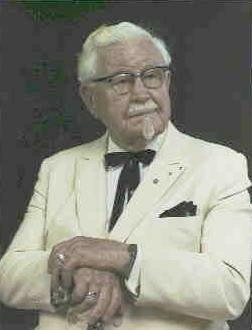 was accused of hacking the official website of the KFC Corporation over the Easter weekend last year. KFC is filing a criminal lawsuit against the radical group, claiming that Eggs First! violated Title 18 of the United States Code (U.S.C. Section 1029) dealing with computer fraud and abuse. In a companion civil case, KFC is suing Eggs First! for damages and lost income due to interference with one of their primary advertising outlets. It took company IT specialist's three days to clean up the site and remove all of the Eggs First! propaganda and graphics. With a lavish attendance by star ovaprimationists from around the world, The Ova Prima Foundation kicked off its Annual Charity Fund Dinner, proceeds of which go to the Partnerships in Lifelong Learning program, with an address by Ova Prima Celebrity Spokesman Gavin MacLeod. MacLeod, beloved to millions as Captain Merrill Stubing of the ABC television series The Love Boat and currently starring in the Broadway musical adaptation of Barry Manilow's Copacabana, rose to unqualified approbation to deliver his remarks. "I've received a lot of yuks in my life," said the chipper 70-year old, "but only at Ova Prima gatherings can I expect to get some yolks." Before the laughter had died, MacLeod added, "But seriously. We are here this evening to celebrate the advances in science that the Ova Prima Foundation has made, both over the past year and since its founding in 1887 by Craigorn Shippen, Jr." MacLeod went on to list the grants given by the Foundation over the past year, and highlighted much of the intramural research generated by the Foundation that has seen publication and comment in the public sector. MacLeod then introduced Ova Prima Foundation president, Dr. Joel David Forsyte. "It is an honor to see all your faces," the president said in a heartfelt speech to those assembled. "I am so very proud to be a part of our ovaprimationist community." He was met with thunderous applause and a standing ovation. Over a light dessert of flan, special celebrity guest Linda Rondstadt treated the crowd to a medley of tunes celebrating her Mexican heritage. MacLeod joined in for a special finale of "The Sunny Side of Life." Over $14,500 was raised for the Partnerships in Lifelong Learning program. Prague - Dr. Frederich Blott was presented with a Lifetime Achievement Award at a banquet hosted by the International Congress of Oogeneticists in Prague last month. Dr. Blott's contributions to the field of oogenetics were honored in a speech by Dr. Alan Jackson. Dr. Jackson was a surprising choice of speaker, given the heated exchange between Blott and Jackson on the "DL7" controversy in the pages of the American Journal of Archaeological Oogenetics (AJAO 132(10):342-346; AJAO 132(11):625-632). The two scholars greeted each other cordially at the podium and shook hands. Dr. Blott stated that he would use his prize money for continued research on environmental axial fracturing. Ovaprimatological researchers Georg Knichtenfel and Tiffany Rhys were wed in a ceremony at the Ova Prima Foundation campus on November 5. The wedding was attended by three hundred family members, friends, and ovaprimatological colleagues. 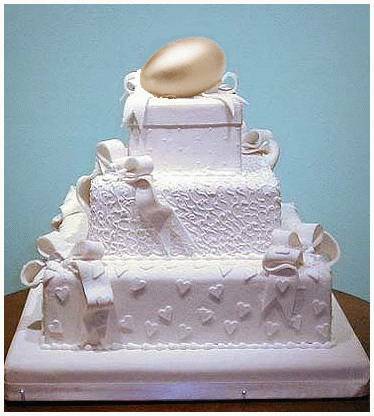 The happy couple's resplendent wedding cake was appropriately crowned with a 3 pound chocolate and marzipan gilded egg. Dr. Knichtenfel is a graduate of the Universität von Bronn where he is now an associate professor of oogenetics. Dr. Rhys-Knichtenfel, a respected member of the Ova Prima faculty, is a graduate of the University of Washington's School of Oogenetic Archaeology. The couple met as post-graduate fellows at the Ova Prima Foundation and have formed one of the most productive research teams in ovaprimatology. Congratulations and best wishes, Georg and Tiffany! May your marriage be as successful as your collaborative research. The Knichtenfel wedding cake. Home News Mission History Education Research Grants Contact Us!